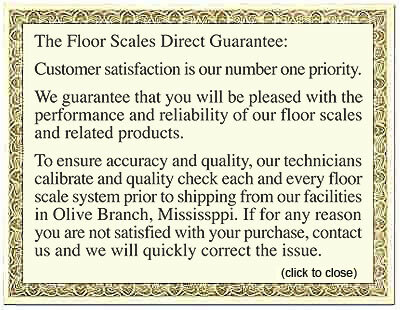 FloorScalesDirect.com, a division of the Triner Scale & Manufacturing Company, offers 10,000 lb industrial floor scales for sale. Rated for indoor or outdoor use, these 5x5 floor scales are delivered with weighing deck, digital indicator, and all the cables and cords you need to get started. 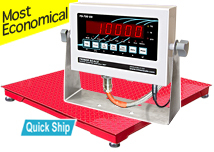 The weighing deck features a diamond plated top deck, self-leveling shock absorber feet, and a mild steel junction box. 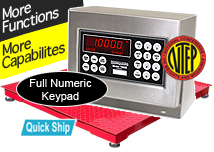 Our digital indicators provide increased functionality and easy to read displays of either LED or LCD digits. 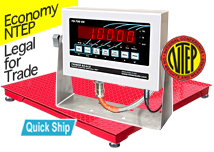 Our industrial floor scales are designed for high accuracy results and quick, easy setup. 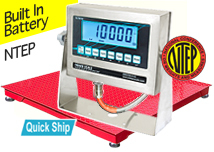 If you’re looking for industrial floor scales for sale, our packages equip you with everything you need to start weighing. Whether you’re operation requires warehouse shipping and receiving or the weighing of containers, pallets and skids, drums, and more. Browse our selection of 5x5 floor scales at FloorScalesDirect.com and take advantage of free shipping to most of the U.S. today!